Sinn Meang’s cheeky, fun-loving, prankster personality is switched off as soon as he sits down, replaced with his serious, intelligent, businessman persona. This self-made Cambodian who loves a laugh, a joke and to poke a bit of fun as much as his fellow countrymen and women, knows when it’s time to look at things seriously. And he takes his NGO, Volunteer Building Cambodia, very seriously. Some non-government organisations have earned a bad reputation in Cambodia, for their money-grabbing ways and for exploiting children and vulnerable people and for a long time Sinn wanted nothing to do with any NGOs. His perspective changed a few years ago when he started working for the British organisation, Volunteer Project Overseas. It ran several programs, including building projects. He liked what he saw and the way it was run. When they wanted to hand over the running of the organisation to local people Sinn searched for someone with experience in construction and good English skills but couldn’t find anyone with both sets of skills. So he ended up running it himself. In March last year, he set up Volunteer Building Cambodia. This small NGO focuses on building houses for poor people in rural areas who are living in very basic shelters. It is a stringent process of evaluation to determine the people most worthy. And Sinn feels the weight of each and every one of those decisions. He is very conscious that the houses are built by the generosity of monetary donations from volunteers and organisations as well as physical labour to construct them. And he ensures everything about the NGO is transparent and accountable, recording every stage of the construction, naming organisations and individuals who have contributed to each project, so they know exactly where their money went. One of the toughest parts of his responsibility is ensuring the right people are the recipients of each house and that they are truly in need. He also insists that they need to own the land and not be in any debt, so they are not at risk of losing the house to someone they are indebt to. He employs a social worker to help with this work but does many of the checks and balances and liaison himself. It is a big job and a big responsibility. Australian volunteer, Jason Argenta helps out with the volunteer co-ordination, administration and also helps the social worker. 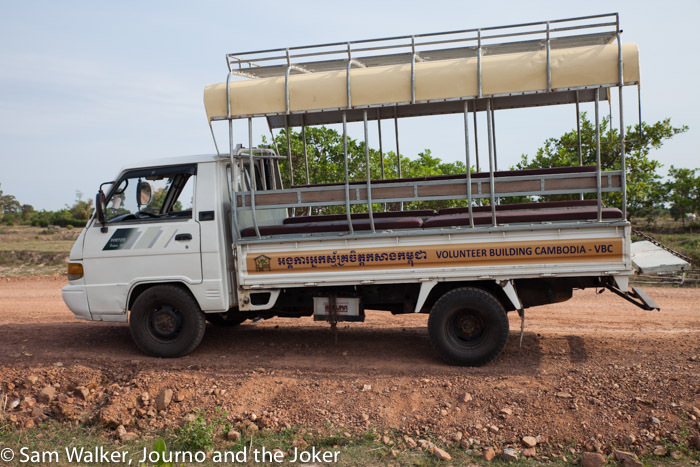 Volunteers and workers are transported to the house sites in the VBC truck and for big groups in Sinn’s minivan. The 38-year-old grew up in a poor family on a rice farm in a fishing village in Kandal Province, about two hours from the nation’s capital, Phnom Penh. He was the youngest child and his father died during the Khmer Rouge period. “I stopped studying in grade eight because my family is poor,” he says. The high school was about 25 kilometres away and he would go by bike but often his friends needed to dink him and it wasn’t practical for a one-hour bike ride. After that he went to live in a pagoda with the monks for two years but at the end of two years he says he could not do it anymore so he moved to Phnom Penh to work in construction. 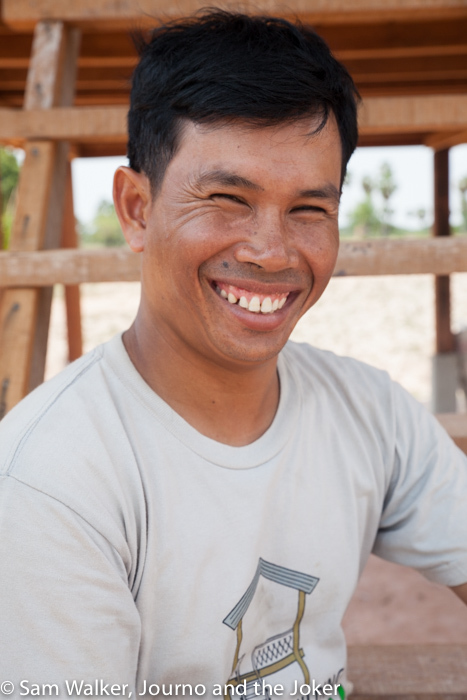 With little education and only fishing and farming skills behind him, he decided construction was a way he could help himself out of poverty. Sinn is a man with his head screwed on properly. He understands people, but most importantly for a man in business he is organised, logical and able to plan ahead. He worked for a big construction company in Phnom Penh and eventually oversaw the building of a four star hotel. After building the hotel he opened his own tourism business. And with a good grasp of English and an easy-going nature that appeals to foreigners, Smart Sinn Travel and Tour has been a success for Sinn. The organisation takes up much of his time and he is onsite most days from 7am to about midday, overseeing the construction of houses and the needs of volunteers and the families receiving the house. On a worksite, you will hear him swearing with words you might expect to hear on any Australian worksite. But they are somehow more humorous than offensive when heard with his Cambodian accent. And he can often be spotted with a video camera, phone or ipad taking many snaps of the work in progress. You will hear him counting in for the crew. He takes the whole process seriously. At the house blessing ceremony, which takes place before the family moves in, you can often find Sinn taking part in the ceremony and giving thanks to the monks. His wife of five years, Nareth, runs the tourism business while he is busy with the NGO unless he is needed. “My goal is I’d like to be something better, not construction – but now still (I’m doing) construction,” he says. But there is a lot to be said for someone who takes the time to run an organisation with the sole purpose of helping improve life for people in poverty, seeking the satisfaction of seeing happy, smiling faces at the end of each project. “All the western people that come to spend money so they can help Cambodian people. 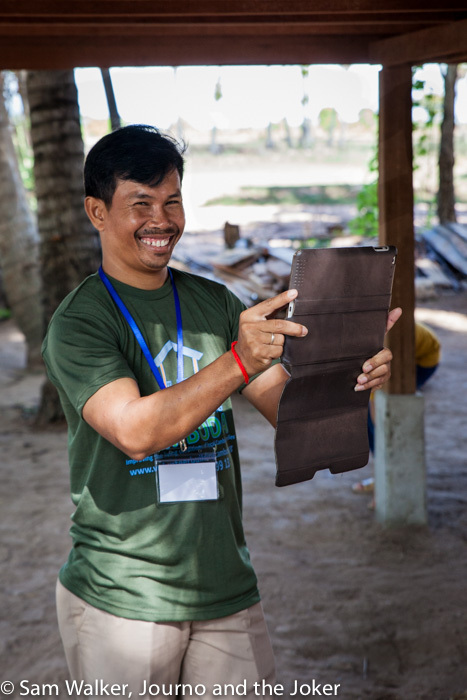 “The main (reason I am) still doing this project is because I can still help people and also I can see how the money is going,” Sinn says, referring to his ability to make a difference to his own people and to remain accountable. It is a relatively new organisation with a minimal budget and no allowance for advertising so most volunteers have found the NGO though word-of-mouth and through the Facebook page. Visit the website for more information about Volunteer Building Cambodia.